The Gaskell tarnished silver kitchen pendant light is retro and industrial. A 36cm diameter tarnished silver finish industrial style pendant, with a thick-set glass light diffuser, industrial strength metal clasps and suspension chain. 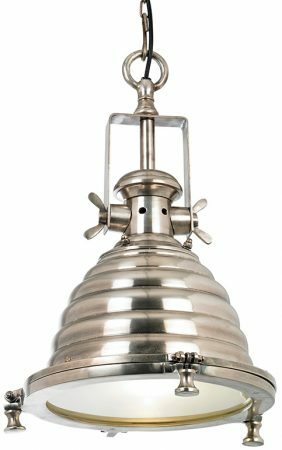 This stylish tarnished silver finish hanging lantern would make a great addition to today’s industrious kitchen area, arranged singly or in multiples to light a breakfast bar or dining area. Height adjustable at the time of installation to a minimum height of 650mm to a maximum drop of 1270mm. Hello Berni. The Gaskell is the only light fitting in the range so there is no exact match. However if feel that the Palmer, Idaho and Osaka would be a good match. Please do feel free to contact our sales office on 0151 647 9472 and our slaes staff would be more than happy to assist you further. Kindest Regards.